With all the sparkly vampires roaming our movie theaters, we need the Daywalker more than ever. Incarcerated movie star Wesley Snipes says that if planet aligned just right, he'd consider reprising his role as the human/vampire hybrid Blade in a new movie. However, he made it clear that he wasn't waiting around for someone to offer him the part again. "Under the right circumstances, with the right team, yes, I'd do another one," he said. "It would be nice to fulfill some of the really cool plans we had for Blade, but didn't get the chance to go live with." Getting those right circumstances might be a little harder than it sounds though - even if the actor wasn't in prison - as Snipes sued New Line Cinema and David S. Goyer, the studio and director behind Blade: Trinity. He alleged that his salary for the movie was missing more that $3 million, and that the studio and director made poor decisions - which he, as a co-producer, should have had a say in - that resulted in a poor box office performance compared to the previous moves in the series. The suit is still pending, but it's hard to see New Line wanting to bring Snipes back in a hurry. 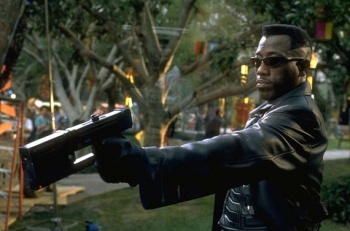 Despite his views on Blade: Trinity, which also stared Ryan Reynolds and Jessica Biel, Snipes thought that the Blade movies deserved more credit than they got for jump starting the comic book movie trend. He said that while gamers and "people on the street" appreciated what the series had done, the movie world saw the series as the "ugly step child" or the "kitchen help" of comic book movies.